Want to learn how to make your own pixelated wall art? Transform your plain walls into gorgeous works of abstract art with this super easy wall art idea. Painting is one of our all-time favorite things to do. It can change the look of virtually anything and breathe new life into almost anything. On our blog, we do a lot of paint projects. It’s kind of our “thing.” We just love it. 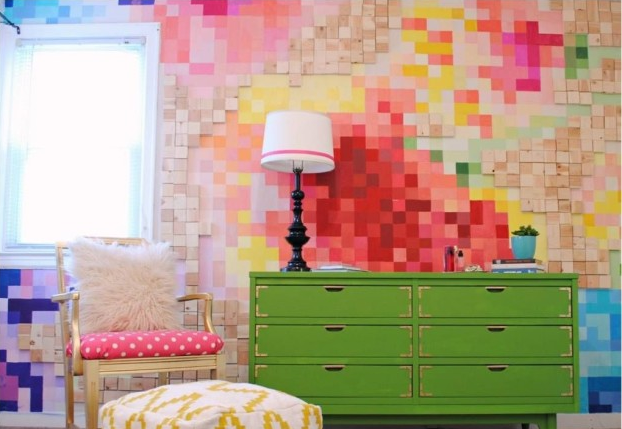 Today, we’re excited to show you how we created this DIY Pixelated Painterly Wall Art. It is pretty easy to do, but I’ll give you fair warning, it is quite time consuming. First, we decided we wanted to design a floral image. I’m not a mural painter by any stretch, so we thought it would be super fun to modernize it a bit and create a pixelated image. We ran the Mosaic filter on our floral image in Photoshop. You can do this with pretty much any image. It’s really fun! It will also allow you to determine how large or small you want your squares during this step. Next, we divide the wall into the right amount of squares. This was probably the hardest part of the project, figuring out how many squares and what size they should be. I used a laser level and a pencil to mark off my squares. Next, bust out your patience! I hand painted each and every square that had any color on it. I printed a copy of the pixelated image and taped it on the wall so I could refer to it as I went. This is where you can get creative with mixing colors. You will become a pro color mixer after this project. When the entire wall was done, I applied over 400 wooden blocks to all of the white space on the wall. I used mounting tape and those babies were not coming off! They are lightweight so they stuck very well! That’s it! It’s pretty cool because it makes a huge impact but it’s not that difficult. As long as you have loads of patience and you’re not in too much of a hurry to get it done…like we were! Doing this project in 3 days was basically madness, but we are in love with it! What do you think? Are you going to make your own? Let us know below in the comments!